“Extraordinary the tricks that memory plays”, a character exclaims in Samuel Beckett’s Waiting for Godot. One would be hard pressed to find a truer statement. Especially here, as recollections play a central part in this classic tragicomedy. The work being given a very fine revival by Druid Theatre as part of Lincoln Center’s White Light Festival. 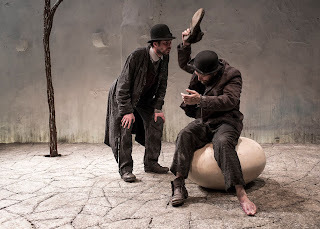 As the show begins, Vladimir (Marty Rea) and Estragon (Aaron Monaghan) are standing in a rather empty setting, with only a barren tree and a boulder big enough for them to sit on to be seen. It soon becomes apparent these two men have long since fallen on hard times. They now existing on the fringes of society. Vladimir, the more intellectual of the two, continually tries to find ways to keep their spirits up; while Estragon, who can best be described as a defeated realist, tends to forget more than he remembers and would just like to find some peace in the world – either through sleep or death. Estragon does however, remember when pain is afflicted upon him. Though he’s not always sure by who or when. Vladimir and Estragon’s one apparent hope of salvation is the mysterious Mr. Godot. This is the reason the two are waiting at this spot, and why they will continue to do so until he appears. Though exactly when that auspicious moment will occur is a matter of conjecture. Until then, they remain trapped in a cycle of passive waiting. They basically repeating the actions of the previous day, albeit with certain differences. A true testament to the staying power of any theatrical work is its timeless quality and openness to interpretation. Director Garry Hynes and movement director Nick Winston tapping into both in this production, which emphasizes its potential for humor, as well as various phrasings in the Beckett text. Bits of physical comedy abound here, particularly in the movements of Vladimir. Rea giving extra emphasis to his character’s walk and gestures. He at times bouncing about rather than simply moving. Monaghan is usually more subdued as Estragon, but does get in several nice comic moments. Especially when trying to pull his boots off. Or put them on. Exactly who Vladimir and Estragon are can be interpreted in many ways, as can just about everything else in the play. However certain key words and phrases do crop up, which help to define them. Estragon says at one point that they’ve lost their rights. Vladimir immediately correcting him, saying “we got rid of them”. This exchange having a somewhat chilling connotation that can easily be applicable to today's world. Where those too content with the way things are, find themselves unprepared when change appears. There’s also a moment when Estragon tells his friend, in response to a query “don’t let’s do anything. It’s safer”. Thus showing how these two prefer to stay on the edge of events, rather than becoming directly involved in them. This attitude even extending to the possibilities of suicide. Estragon often contemplating the two killing themselves, with Vladimir continually talking him out of it. Not that Vladimir doesn’t think the idea has merit. It’s just that they never seem to have the necessary equipment to carry out Estragon’s plan. Another theme present in the play is the need to affirm one’s one own existence. Vladimir drives this point home most effectively when, after surrendering to a moment of despair, he asks a Boy (Nathan Reid), who has come to deliver a message from Godot, to “tell him that you saw me”. This air of hopelessness popping up again and again throughout the story. In a nice twist of irony, it is the more fatalistic Estragon who occasionally suggests the two leave this place and start afresh somewhere else, only to have Vladimir always remind him why they cannot. At least not yet. Monaghan and Rea have a comfortable chemistry with one another, and one can easily believe their characters have been together for fifty years. Also quite good are Rory Nolan and Garrett Lombard, who appear as Pozzo, a well-to-do-sort, and his ironically-named servant Lucky. Pozzo clearly a parody of an overstuffed and entitled ruling class, yet completely dependent on Lucky for his own survival. At the same time Lucky, despite being treated horribly by Pozzo for so long, simply refuses to leave him because he can no longer conceive of any other form of existence. It’s a situation Vladimir and Estragon are also heading for if they're not careful. Interestingly, there are moments when Pozzo and Lucky so fully take the center stage, Vladimir and Estragon become little more than observers in the production. The set by Francis O’Connor is bleak, bare and perfectly matches the story’s overall atmosphere. 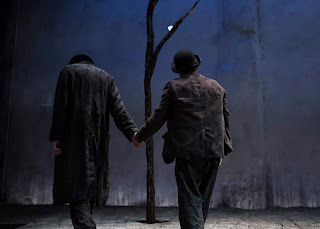 O’Connor’s costumes for the characters work quite well, particularly the black outfits worn by Vladimir and Estragon. Also perfectly integrated into the piece is the alternatively stark and subdued lighting by James F. Ingalls, and the sound design by Gregory Clarke. 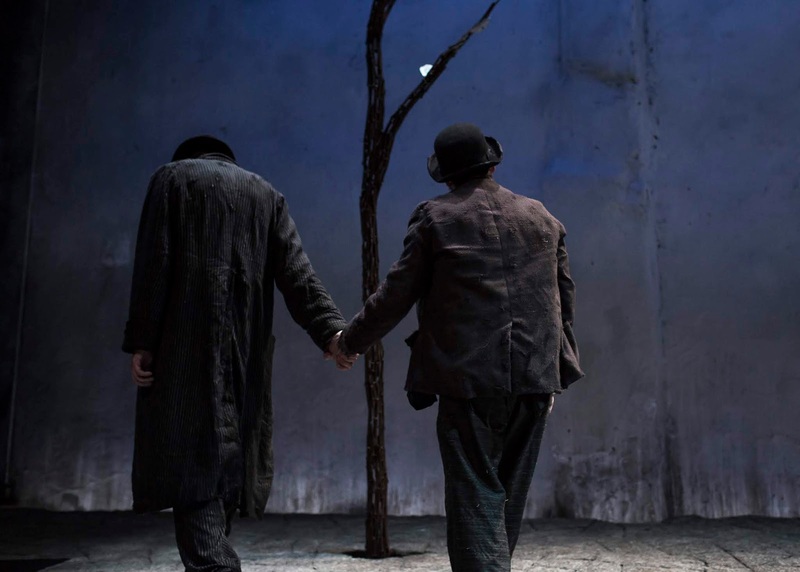 Offering a thought-provoking look at the dangers of having one’s fate being determined by others, this production of Waiting for Godot makes for quite the illuminating experience. Featuring: Garrett Lombard (Lucky), Aaron Monaghan (Estragon), Rory Nolan (Pozzo), Marty Rea (Vladimir), Jaden Pace/Nathan Reid (Boy).